This rose was first bred in the Unites Stated in 1988 by Dr Robert Basye who lived in Texas and was a retired professor who taught mathematics at Texas A&M. He bred roses for well over 50 years and strived to create breeds that would be resistant to black spot, as well as be exceptionally hardy. He was also very fond of thornless roses. 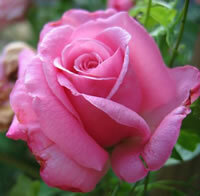 He created the rose Belinda's Dream by crossing a Jersey Beauty with the Tiffany hybrid tea rose. 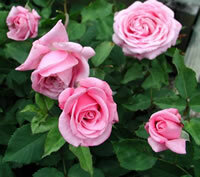 Belindas Dream Roses got their namesake from one of Dr Bayse's friends in Texas, who had a daughter named Belinda. This stunning rose is a shrub rose that is highly resistant to diseases, and being bred in Texas, it has an unusual tolerance to hot climates. Unfortunately that makes the rose Belinda's Dream a little less hardy to colder temperatures so this rose is more suited to zones 6 through 9. 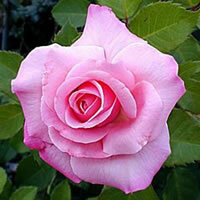 The blooms on this rose come out in a gorgeous medium pink hue and slowly fade to a light pink. They have a very pleasing fragrance that smells almost like raspberries and the bloom will average about 4 inches or so in diameter with a lot of petals, upwards of 50 to 100 per bloom. The rose Belinda's Dream is a repeat bloomer so if you dead head it after each bloom, you will get repeated flushes through the rest of the growing season. Rose growers frequently grow this rose to use for cut flowers, because the fruity fragrance certainly adds appeal to just about any bouquet you put them into. Also because of Belinda's tolerance to heat and resistance to diseases, it tends to be a very low maintenance rose, making it ideally suited for novice growers, or growers who just don't want to be tied to a high maintenance plant. Belindas Dream roses will stay quite full and bushy no matter where you grow them. If you want your roses to have a large amount of blooms, choose a location for them where they will get plenty of sun light, at least 6 to 8 hours a day of direct sun light or more. You also want to make sure the spot you choose has soil that drains real well. The rose Belinda's Dream, like most roses, does not like to grow in standing water. Planting your rose Belinda's Dream is easy and very straight forward. Before you do any digging, I highly suggest taking a trip to your local garden center and picking up a bag of a nice organic compost. This stuff is generally inexpensive and it is a superb amendment for your garden soil. When you dig your hole, put the soil into a wheel barrow and mix it with the compost at a ratio of 2 parts soil to 1 part compost, then use this as your backfill. You will be amazed at how well this stuff works. Once you have selected the right location for your Belindas Dream roses, you have to decide how big of a hole needs to be dug. If your plant came as a bareroot rose, then you will need to dig the hole wide enough to accept the roots without forcing them into the hole, and deep enough that you can mound up a sizeable amount of soil in the center, and have the bud union set about an inch or two below the surface once the hole is filled. If you bought your rose Belinda's Dream from the local nursery and it came in a container, then you should dig a hole that is twice the diameter of the container, and equally as deep. Once your rose is set into place, back fill the hole about halfway with your new soil mix. Then stop and water the loose soil thoroughly until it is the consistency of mud. You can then back fill the hole the rest of the way and give it one more deep watering. What you are doing is making sure the soil fills in around the roots completely and does not leave behind any air pockets. Taking care of your rose Belinda's Dream is not at all difficult and you can follow a few basic practices that really work well on most types of roses. First off are the moisture requirements. Roses in general need ample water to produce blooms, but you don't want to over water them or leave them standing in water that won't drain. This will cause you many problems with pests and diseases. Typically your roses will be happy with one thorough watering each week, but if you live in a hot and dry region, you may have to step that up to every 4 to 5 days. Just monitor the soil to moisture on occasion and when you do water, never water from the top down and soak the leaves, always try to water the base of the plant as much as possible. 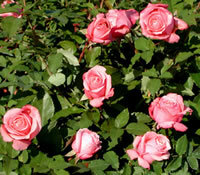 You can also fertilize your Belindas Dream roses in early spring, just as the leaves start to form. If you are hoping for repeat blooms, you can give your roses another feeding as the first big bloom develops, and one more around mid-July or so. Just be sure not to over fertilize and try to leave about 4 weeks in between feedings. 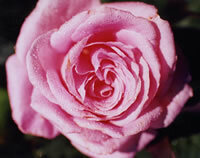 You should prune your rose Belinda's Dream in early spring each year before the leaves start to form. Start off by removing all the dead wood as well as any canes that look like they are diseased or unhealthy. You also should clean up all the leaves and debris around the base of the plant as decaying matter is a breeding ground for pests and diseases. Cut back the main canes about one third of their length, and prune any lateral canes that overlap one another as these will compete for sunlight once the leaves open up. Ideally you are looking for an open center plant that is well formed.